Academic accolades are achieved by earning excellent grades at the college or university chosen by the student. These grades are calculated into a grade point average (GPA) to determine where the student is placed in his/her class. Most colleges and universities use a GPA calculator to configure their students’ GPA at the end of each term. It also is used to award scholastic achievement. One of the purposes of a this is to expedite the calculations, which when done manually, can be very long and cumbersome. Most small schools usually do not have the manpower to handle this process; even though the number of students attending is small, large schools usually have this problem also, but for a different reason. They are usually looking at thousands of students that have to be calculated in a short period of time. The other main purpose of the this calculator is reducing errors in the calculation by hand. Once the formulas have been set up in the spreadsheet, the GPA will automatically calculate based on the grades that are inputted. Calculating a GPA is not a hard process, but it can be very error-prone. The excel spreadsheet reduces the errors dramatically. 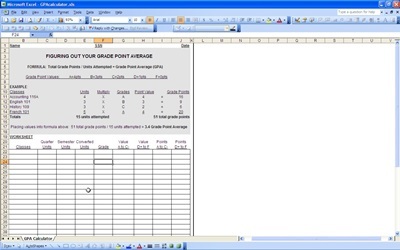 The grades are put into the spreadsheet and the formula is automatically run. The formula uses a scale that is determined by the school. The school assigns each letter grade a certain number of points that are multiplied by the number of credit hours each class is worth. The quality points are added together and multiplied by the total number of credits for that term. This gives you the student’s GPA for that term. All in all, the GPA calculator expedites time and reduces errors to providing the student an accurate GPA.